The American Protestant Missionary Century: A Review of David Hollinger's Protestants Abroad: How Missionaries Tried to Change the World but Changed America "
David Hollinger, Preston Hotchkis Professor of American History Emeritus at the University of California, Berkeley, has written one of the most important books about religion in twentieth-century America to appear in the last decade—a book that will reshape the way we think about the historical arc of American Protestantism in this period. While many of the most important books written in the past forty years on religion in twentieth-century America have focused on Protestant evangelicalism, Hollinger pays that branch of Protestantism little attention except as it appears as a foil to mainstream Protestantism. Instead, he focuses on foreign missionaries (along with their children and sending agents) from mainstream Protestant denominations, from roughly 1920 to 1970. Hollinger argues that this missionary circle constituted an almost singular force, along with urbane Jewish intellectuals, that brought about a new cosmopolitanism in American arts and letters, Protestant theology and ecclesiology, academics, and, perhaps most importantly, U.S. foreign policy. In their mission fields, these mainline missionaries, and especially their children, grew uneasy about privileging their own religion and culture above that of their neighbors. In doing so, they moved away from an emphasis on evangelism to focus on medicine, literacy, agricultural reform, and other forms of service, not as a means to evangelization but as an end in itself. In the process, they transformed their sending agencies, their denominations, and eventually U.S. society. With this story, Hollinger not only uncovers a lost narrative within American Protestantism but forces us to rethink how we tell the story of American religion in the twentieth century. It is not surprising that we might underestimate the impact that these “missionary cosmopolitans” had on U.S. society—an impact often greater than their actual numbers would indicate. In the first place, there is the perception that western missionaries constituted a cultural and military vanguard for western imperialism. While Hollinger notes there is some truth to this, this imperialism was not the end of the story; as just noted, mainline Protestant missionaries boomeranged back as a force that “advanced domestic programs that would later be called ‘multicultural’ and foreign policies that prioritized alliances with nonwhite, colonized peoples” (1). Second, we might also underestimate the role of missionary cosmopolitans because the cultural and political role of mainline Protestantism (especially in comparison to Protestant evangelicalism) has so diminished since the 1960s. Nevertheless, missionary influence was tied at mid-century to a vast Protestant establishment in which Protestant leaders and their denominational apparati constituted the most important religious-cultural force in American politics, academics, and reform. As leaders within these denominations, missionaries had access to the halls of power. Third, their unmatched knowledge of Asia dovetailed with strategic U.S. needs during the Second World War and the Cold War. Finally, missionary influence connected with the rise and influence of anthropology, civil rights agitation among African Americans, and the expansion of post-secondary education. 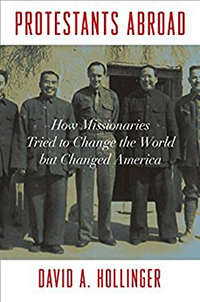 In addition, we might also underestimate the significance of cosmopolitan missionaries because we forget just how parochial the United States and its citizens were prior to the Second World War, especially regarding Asia. For example, when former missionary to Thailand Kenneth Landon (whose wife, Margaret, wrote Anna and the King), was approached by the Office of Strategic Services (precursor to the CIA) for information about Thailand, he found that the agency’s entire intelligence on the nation was contained in a “slim folder” that bore three articles written by Landon himself (187). Landon went on to serve in Washington’s military, diplomatic, and intelligence services in Southeast Asia, becoming “the single person most responsible for the postwar alliance between the United States and Thailand” (188). Another example: in 1941, “the U.S. Navy could find only fifty-six individuals [who where not of Japanese ancestry] in the entire country between the ages of twenty and thirty-five who knew enough of the language to justify possible training in the interests of national defense” (358, fn.28). Almost all Anglo Americans who knew the Japanese language were missionaries or missionary children, and these missionary cosmopolitans became the cornerstone of military intelligence in the Pacific theater, of the academic study of Japan, and of postwar foreign policy in Japan. At the heart of Hollinger’s book are the missionaries and missionary children themselves, who might have set out to make their mission fields more like home but in the process were themselves transformed, and from this inner transformation came a drive to change U.S. Christianity and the United States itself. What made mainline Protestant missionaries so malleable on the field? For Hollinger, there are two main answers to this question. First, unlike U.S. diplomats and business people who engaged indigenous people at arm’s length—typically never learning the language—missionaries actually lived with indigenous people, learning multiple dialects, adopting cultural mores, and, importantly, raising their children in these cultures (most missionary children considered the indigenous language of their mission field their first language). In this deep engagement with diversity, missionaries and their children recognized the historically contingent nature of their own faith and culture and subsequently rejected their Christocentrism and sense of cultural/political superiority, embracing in exchange what we would now call a multicultural outlook. Second, Hollinger argues that the multiculturalism was a direct extension of their liberal-leaning theology that stressed God’s immanence and universal “brotherhood.” Hollinger notes, too, that in this process of transformation, almost all missionary cosmopolitans became ecumenical or interfaith in their theological outlook and many more became post-Protestant in some way, either as loosely committed to their denominations or as agnostics. Perhaps most importantly, even though these cosmopolitan missionaries rejected their Christocentrism and sense of cultural superiority, they nevertheless retained an overarching drive to do good—a kind of secular missionary impulse to change the church and world and especially the United States in a single generation. This secular missionary impulse drove missionary cosmopolitans to impact American society, and Hollinger spends most of the book detailing the specific ways in which they did so. He begins with profiles of three archetypical figures: Henry Luce, whose career as a magazine publisher was unequalled in the twentieth century and who understood his work to be that of a secular missionary espousing “the American Century”; the novelist Pearl Buck; and John Hersey, author of Hiroshima, the latter two of whom were both a bit more ambivalent about America’s moral authority than Luce. Hollinger then moves to lesser-known figures who built some of most important religious, educational, and reform institutions in mid-twentieth-century America. He details how the missionary cosmopolitans shifted their aims from evangelization to service, a move that found its full institutional expression after 1960 in nongovernmental organizations, mainline denominational and interdenominational relief agencies, and, most notably, the Peace Corps. From this shift, the missionary cosmopolitans went on to forge the ecumenical movement that found institutional expression in the Federal and National Council of Churches and the World Council of Churches. Ultimately they arrived at a concept of “world Christianity” that rendered useless the distinction between sending countries and mission fields. Missionary cosmopolitans were involved in the civil rights movement of the 1960s and built from scratch the most important centers for “area studies”—especially for Asian studies—in higher education. These centers, led by figures such as W. Norman Brown, Edwin O. Reischauer, and John K. Fairbank, moved the study of India, Japan, and China, respectively, away from “orientalist” preoccupations with archeology and the like to the study of contemporary society and politics. The most complex and fascinating sections of the book examine the role of the missionary cosmopolitans in U.S. military, intelligence, and diplomatic endeavors during the Second World War and the Cold War, especially in the Middle East, Southeast Asia, China, and Japan. Missionary cosmopolitans consistently sided with indigenous peoples seeking self-determination in these regions, often putting themselves at odds with entrenched powers in Washington. For example, they insisted on the humanity of the Japanese people in the face of a racism that affected the treatment of Japanese Americans and Japanese POWs, and that treated Japanese imperialism as different from that of the French or English (an outlook that helped precipitate Pearl Harbor). In China, they usually sided with Mao against what they saw as the corrupt government of Chiang Kai-shek. In Vietnam, they supported Ho Chi Minh under the wrong assumption that the United States might forge an enlightened post-war regime that supported self-determination. In perhaps the most fascinating chapter, Hollinger details how missionary cosmopolitans broke with the cosmopolitan Jewish intelligentsia to oppose Zionism and support self-determination for Arabs—efforts reflected in the unique relationship between the United States and Saudi Arabia brokered by Colonel William Eddy, himself a missionary kid. As we can see, despite their advocacy for indigenous self-determination and opposition to colonialism (and especially to French and English imperialism), the missionary cosmopolitans, whether because they lacked political savvy or faced stronger opponents—often had mixed results in influencing foreign policy and were, Hollinger notes, unable to prevent American blunders in Iran and Vietnam. While Hollinger tells a vital and fascinating story, he also wants to push the larger narrative of religion in the twentieth century in two new directions. First, for whatever reason, the primary story of twentieth-century U.S. Protestantism has been one that chronicles evangelical ascent and mainstream ennui and decline. For Hollinger, this perception is preposterous. In his telling, without these mainline Protestant missionaries, there would be, for right or wrong, no Peace Corps, no ongoing positive relationship with Saudi Arabia, no decision to retain Hirohito as emperor after the Second World War, no Japanese and Chinese Studies programs at Harvard, no world relief agencies, no Time or Life magazine, no Hiroshima or The Good Earth. You get the picture. For Hollinger, the primary narrative of Protestantism in the twentieth century is not the persistence of Bob Jones University, the rise of the Moral Majority, or Southern Baptist battles over fundamentalism; rather, the most important national and international story of American religion in the twentieth century is the ultimate victory of theological liberalism and its assault on western cultural superiority, which found full expression in a secular imperative to change the world for the better. In other words, for Hollinger, mainstream Protestantism’s theology reached its natural conclusions and won the day where it mattered most—in education, reform, and, though the results were mixed, in international affairs. Second, Hollinger weaves this missionary narrative into his larger work on secularization (see his important article, “Christianity and Its American Fate: Where History Interrogates Secularization Theory,” in Isaac, et. al. The Worlds of American Intellectual History [Oxford University Press, 2016]). For Hollinger, secularization is not a social theory tied to modernization; rather, it is an historically contingent process that takes on different forms in different places. Hollinger thinks that the United States in the late twentieth and early twenty-first century has undergone an historical process he understands as secularization, which he describes as the “decline of dependence on supernatural authority and institutions ostensibly authorized by that authority” (295). For Hollinger, this secularization is necessarily linked to cosmopolitanism, ushered into the United States by “Protestants Abroad” and by the urban Jewish intelligentsia, which “forced a gradual and deepening recognition of the historically particular status of Christianity” (295). In other words, Hollinger understands Protestant liberals and especially missionary cosmopolitans to have been drivers for a modern cosmopolitan and necessarily secular American society, expressed in everything from multiculturalism to civil rights and human rights advocacy to globalization to religious “nones.” This is a narrative with which we must certainly contend.